I hope you enjoy my collection as much as I enjoyed the challenge it presented. The show begins with Gabby, followed by the notes on my overall vision for the collection. Then sit back, relax, and hopefully enjoy viewing and reading about each design. 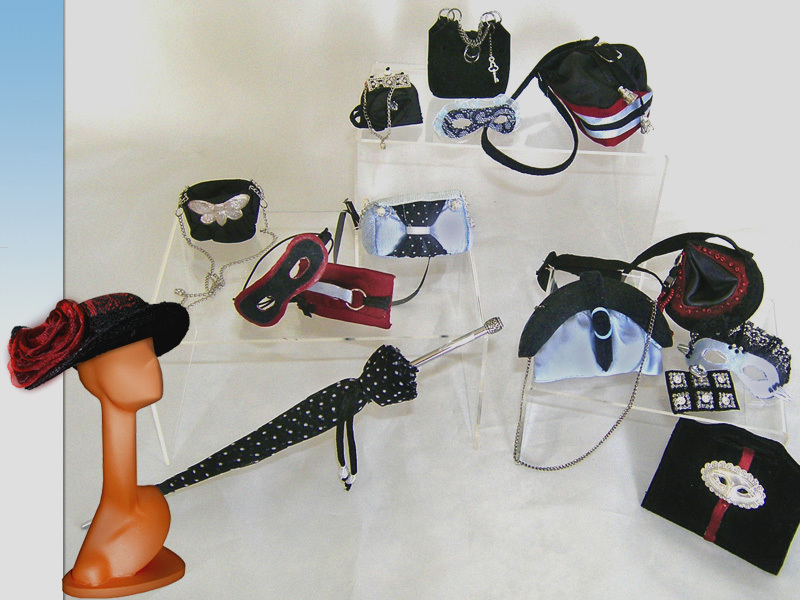 After the final gown is presented you will see the accessories "on parade" in a single picture. That is followed by 6 mix and match outfit examples taken from the range. I didn't have time to dress the actual dolls before the collection was sent so I have represented them using my old friend Photoshop. :-) As you will see the collection is very versatile. When you have finished here you may want to visit my Flickr album. 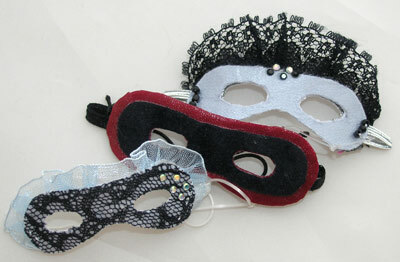 I have uploaded photos taken during the manufacture of the collection. You will see outfits that didn't make it to the runway and designs in progress. It was a challenge narrowing the collection down to just 12 outfits and retaining the continuity as most collections are much larger and flow more naturally. This collection takes its lead from the initial design I presented for the Gabby Challenge. It can best be described as feminine chic with clean line silhouettes. The fabric choices include silk dupion, silk chiffon, lace, delustred satin and a semi-sheer spot. The styling ranges from elegant day wear through to cocktail chic and encompassing full length evening wear. I have used continuing elements to different extents to ensure smooth transitions throughout the collection. 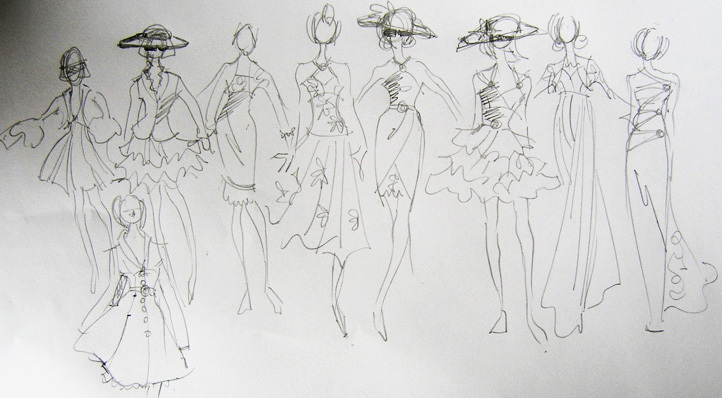 Each design has been produced as a standalone outfit within the collection. There is a definite mix and match ability incorporated into the collection for commercial viability. The order of each outfit on the runway has been specifically designed to follow the style and color detailing but presenting variety with the appearance of each model on the runway. 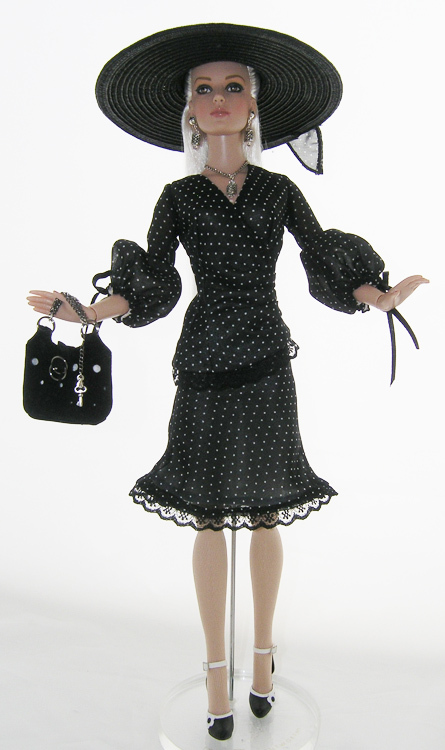 The hats, handbags and jewellery are important accessories and are used to complete the outfits that feature them. The umbrella, sunglasses and masks are for RUNWAY PRESENCE . I have used different fabrics and textures to produce the necessary variety within my collection. This allowed me to keep my color choices simple, but effective. 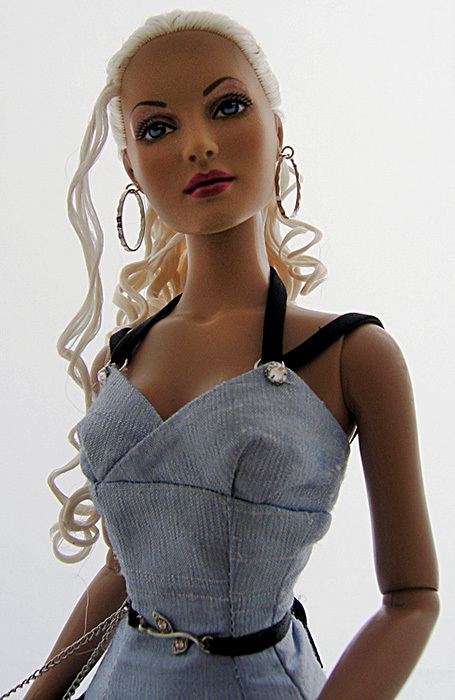 My collection is young, sophisticated and chic with feminine detailing. It could easily be transposed into different color combinations without losing the effect of the styling. A collection with a vintage feel and a contemporary vibe! Broad brimmed straw hat above a black dupion silk jacket with a shawl collar emulating the jacket from the first outfit . Again we have lace trim but this time on the bottom frill of the skirt . The same spot fabric is used in the skirt which is introducing frills that will play a small part throughout the collection. The frills fall from a fitted hip band to reduce any bulk and keep a clean silhouette.There is also a lace trim inside the neck of the collar. Our model carries a handbag that gives this design it's name :-) I have dropped the blue from this outfit and featured the spot to add a contrast between the styles either side on the runway. I wanted to maintain a variety without compromising the collection. Each outfit shouldn't be dependent on the one before or after for impact. I ensured each design contained the connecting styling or fabric elements to make the collection cohesive but versatile. 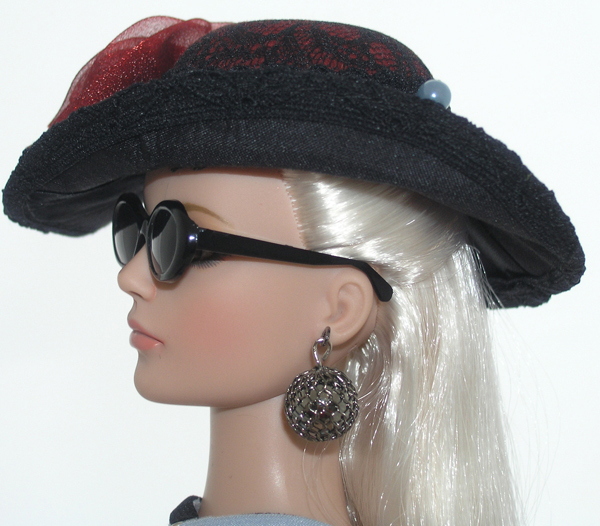 Silver hoop earrings complete the jewellery. Now the spots get their moment to shine. :-) This outfit is a two piece skirt and top. 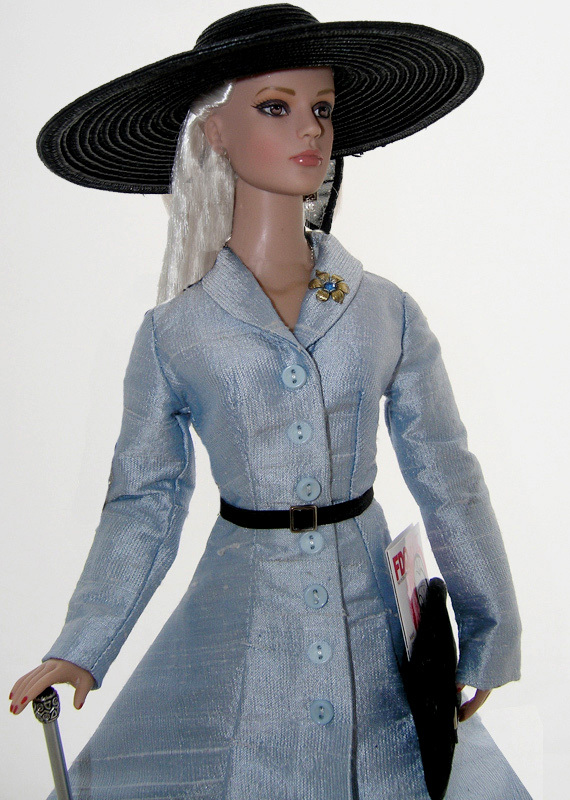 The bubble sleeves are a progression from the first outfit and the broad brim hat is back.The top crosses over and gathers into the sideseam with a lace trim on the hemline.The skirt is bias cut and again has the lace edging, following the hemline silhouette of the first three styles.Skinny ribbon ties are introduced on the sleeves. 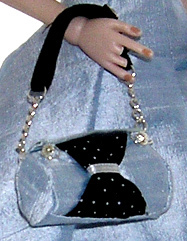 Another suede handbag with holes punched.Our model wears a matching earrings and necklace set. With this style we move from daywear to the cocktail hour with a design in a combination of blue and black silk with lace frills. It's hard to see the detail on the skirt but it is much softer in reality as the lace frilling is sheer on the black silk base. This is where the strapping from the Gabby outfit is reintroduced threading through tiny silver rings at the neckline with a diamante trim. 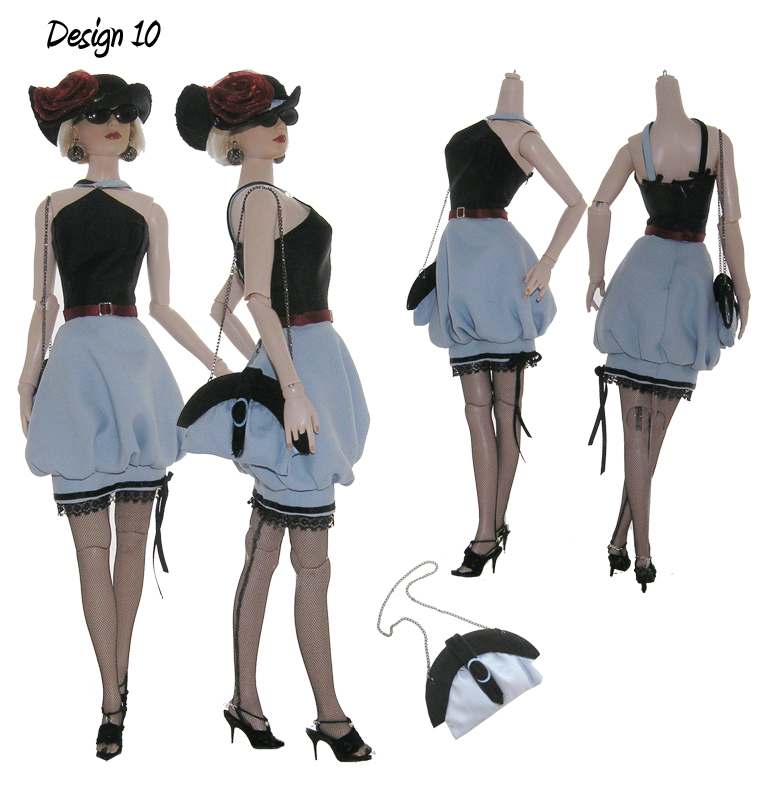 We have a crossover bodice as seen in the last design and a corset style fit. 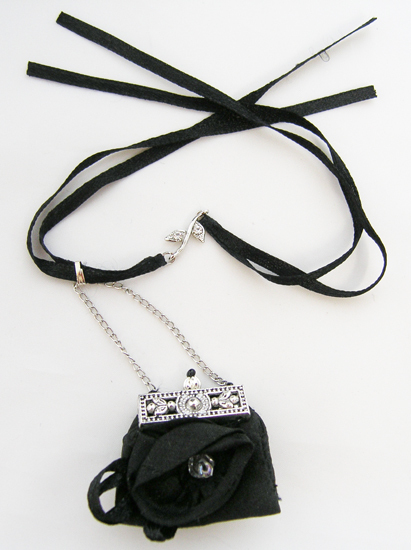 The waist is trimmed with tiny ribbon ties from a silver and diamante adornment at the front waist.The evening bag is black silk with a matching rose on the front and ribbon trim. It has a silver clasp and a tiny diamante set like a dewdrop in the centre of the flower :-) Our model wears large hoop earrings as her only jewellery. We are now at the half way point in the collection and at this stage I am introducing an evening gown taking inspiration from the first five designs. This progresses from the previous cocktail outfit and displays all the feminine chic displayed in the collection so far. 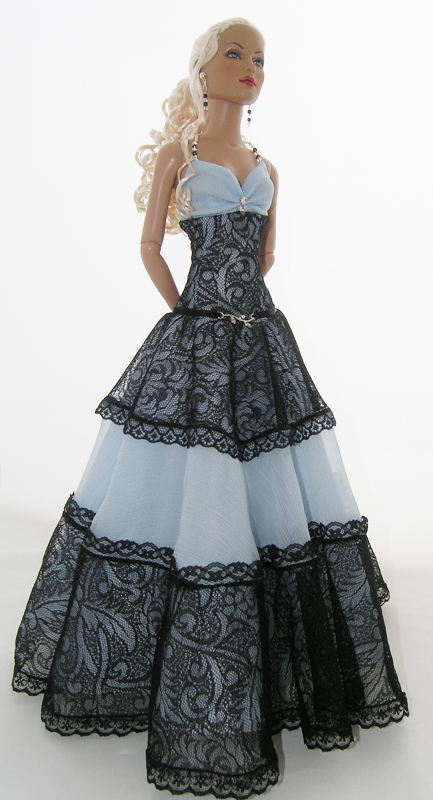 The gown is in silk chiffon with fine lace panels and lace trim. The bodice is taken from the first outfit with diamante trim at the front neckline and a bead and silver chain halter strap joining with a clasp at the back neck, emulating a necklace. The beading configuration matches the earrings. 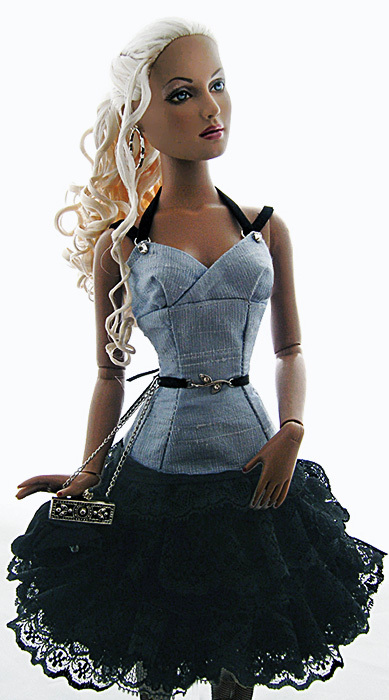 The same corset style bodice is used and the ribbon trim at the hipline is the same as the previous style. The jacket is also in silk chiffon. 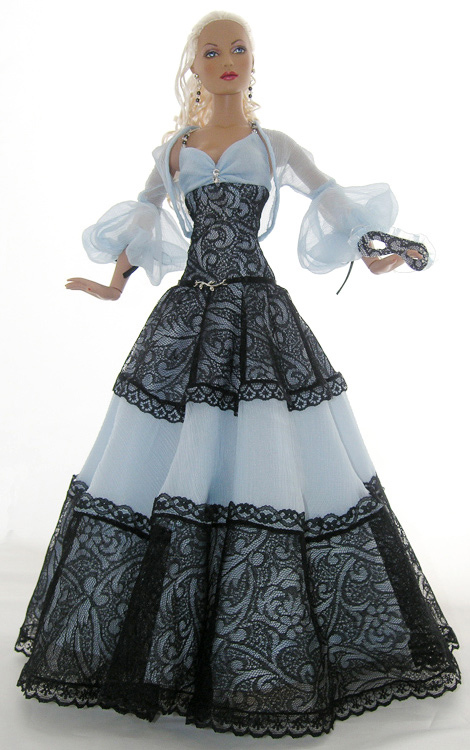 It is the same style as used in the first outfit(without the shawl collar) It has filmy bubble sleeves and tiny ribbon trim.The back of the dress has tiny beads down the opening.The gown is lined with blue to make a focal point of the pattern in the lace and blending it to the chiffon panels. 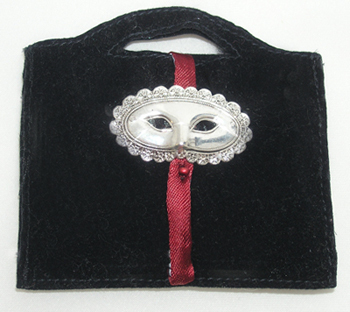 Christina's accessory for the runway is my little piece of theatre in the mask she carries. :-). From here we head in a slightly different direction but taking many of the same elements with us. We go back to daywear and introduce burgundy to the colour palette. The powder blue silk transforms into a more muted shade in a soft satin back crepe. Both surfaces of this fabric will be utilized in the second half of the collection. The second in the Cool......Calm.......and Collected set! This design is made as a dress but could just as easily have been done as a skirt and top as in the previous style for mix and match purposes. The strapping on this outfit is the same as the last style but the black and blue are reversed with the blue going round the neck. The bodice is almost a sweetheart neck but more subtle and the skirt harks back to the first half of the collection with frills lined in the fine lace from the evening gown and a slip with a lace trim peeping from below the hem. 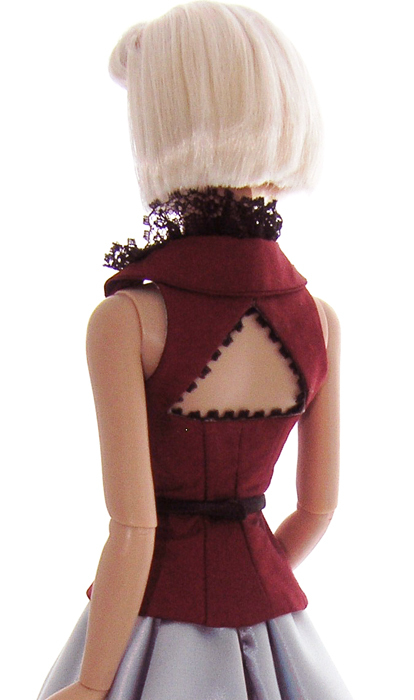 A skinny burgundy belt is sported at the waist. 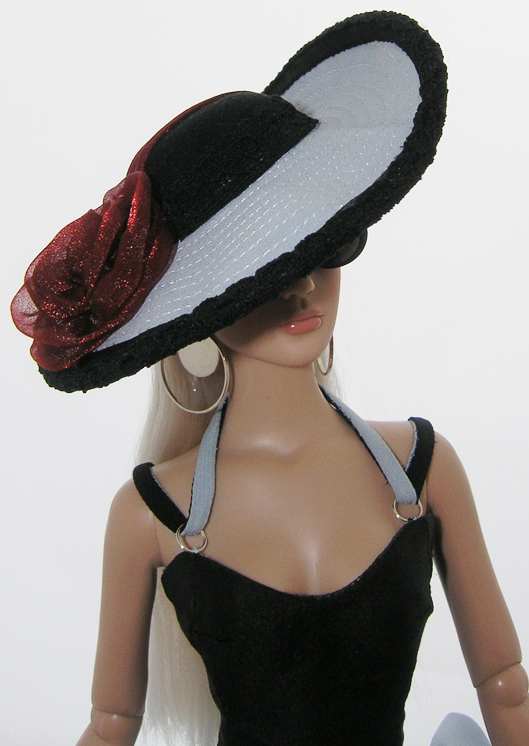 This hat has a wide brim with blue on top and black underneath with a stretch lace binding. 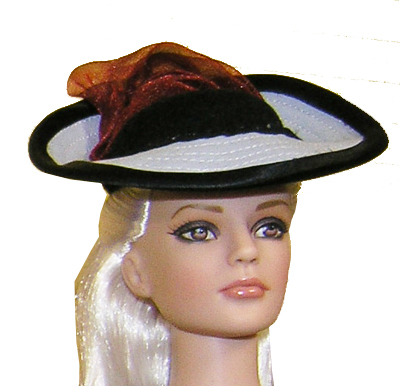 It has a black crown and the same burgundy organza flower trim. 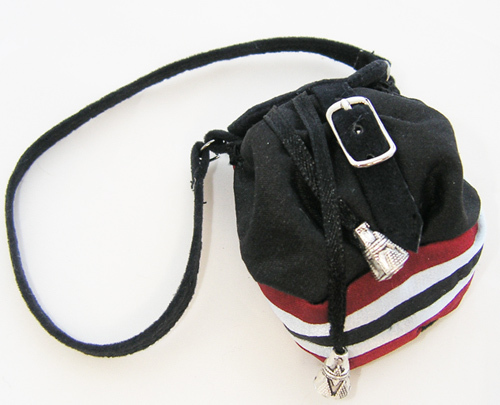 The handbag is black suede with burgundy ribbon trim and featuring my little bit of theatre :-) Our model wears large silver hoop earrings with a silver disc dropping in the centre. I think they are important to the overall appearance of this outfit. Sunglasses wrap up this outfit for our model's day in the spotlight! The finale in the collection goes to this evening gown with a difference. I wanted it to be feminine but maintain the sleek silhouette and fit. I chose to go right back to the beginning with the jacket styling. I have evolved the look into a chic evening jacket with a small shawl collar and a wide lace trim to frame the neck. The jacket is almost a halter cut but retains the armholes to make the feature back dominant as our model turns on the catwalk. 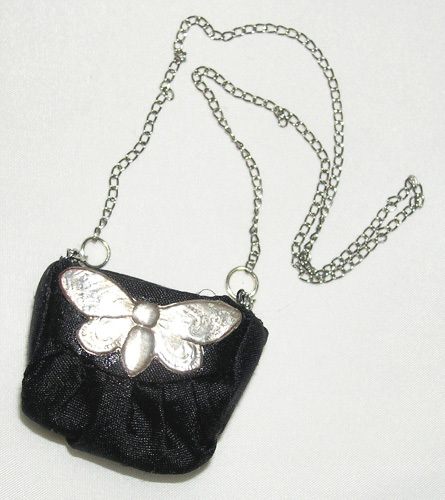 :-) It has diamante buttons and buckle on a tiny black satin belt. The diamante pin on the collar matches the two belt trims used in earlier designs. The triangle cutout in the back has black lace trim to frame the elegant highlight of this jacket. 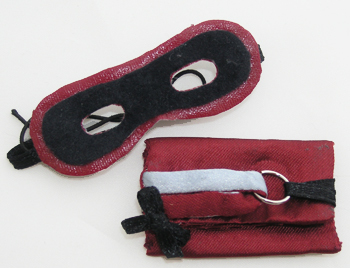 (The color in the closeups of this design is the closest to the true shade of the burgundy. It is a vibrant color not obvious in most of the pictures. ) 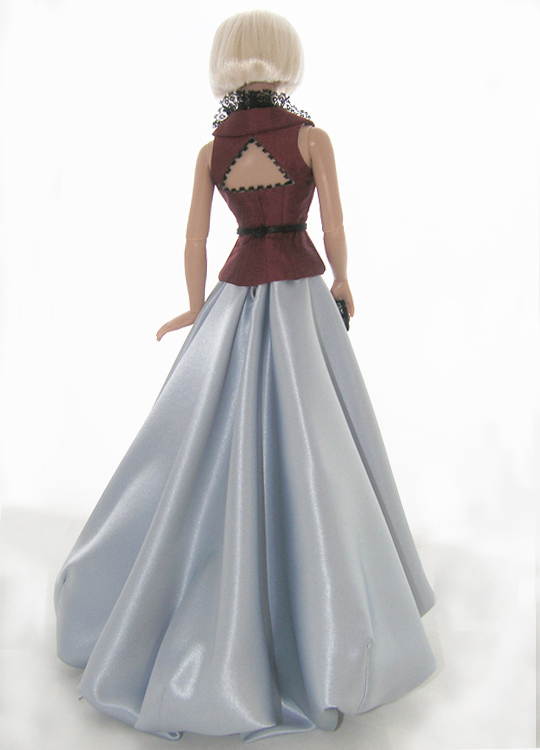 The skirt to this outfit is made on the satin side of the fabric giving it a silver sheen appropriate for evening wear. 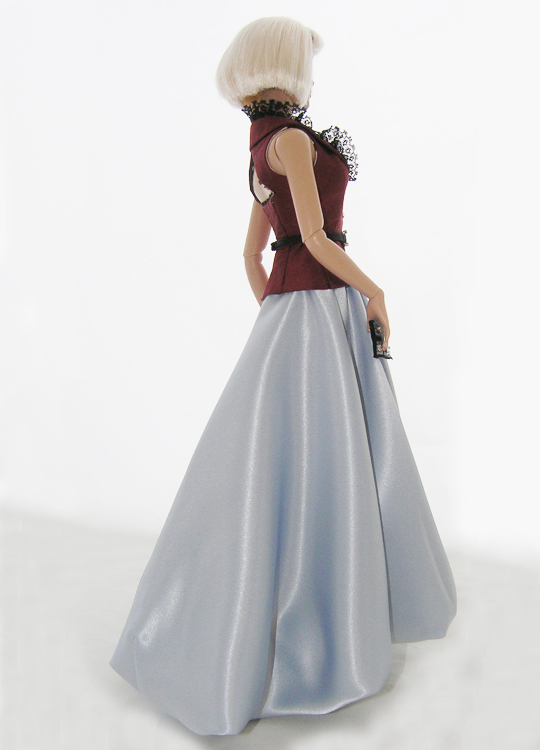 The bubble skirt is cut very long on a full circle and then darted all around the hem to give a bell effect. It is then gathered onto a lining in an A-line shape and cut a lot shorter than the satin. Both were cut longer at the back to attain the slight train. The effect I wanted to achieve from this is evident in the way the skirt falls. It sits out nicely and moves and poses really well. It is incredibly full and I was happy with the result. There is no bulk at the waist so I was able to retain a fabulous silhouette. 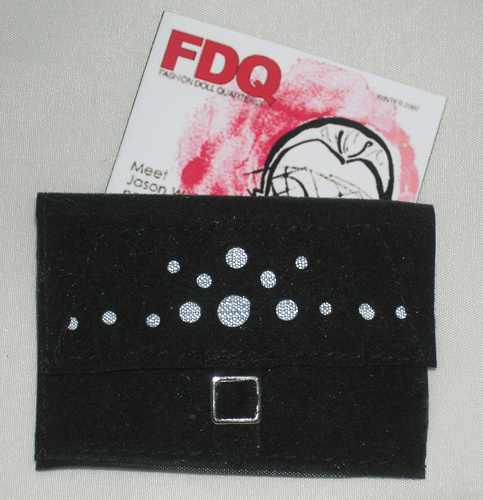 The clutch bag is black velvet with bead and diamante trim and a diamond -;) clasp. 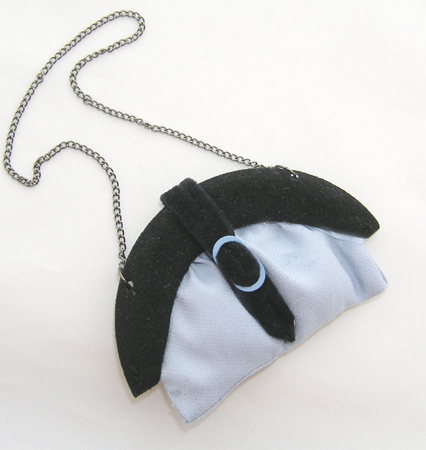 Our closing model wears a diamante necklace and carries my final thread back to theatre, the mask. 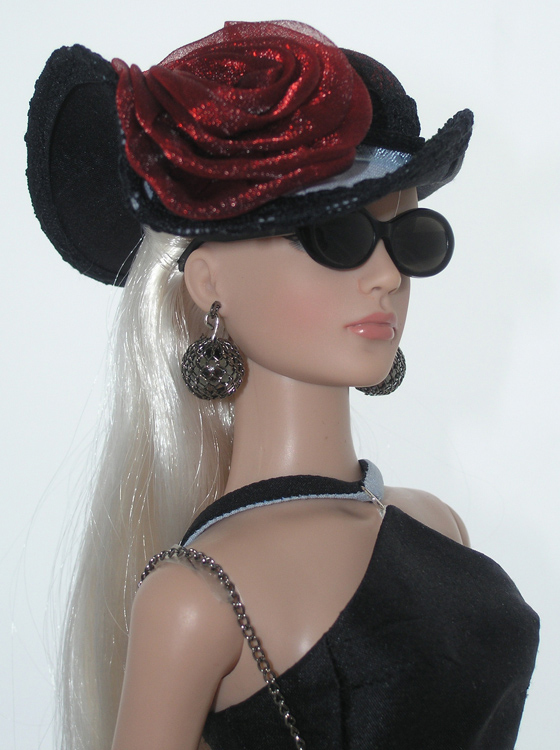 Below this last design you will see six mix and match outfits I have put together as an example to show the versatility of the collection and all the accessories displayed together. Double your Designs with Mix and Match! It was a lot of work and stress but a lot of fun and I felt a great achievement. A YouTube copy is also on my Video page. As the song says, it was as close to "perfect" as I could make it at the time!